"Guilty or not guilty?" demanded Mr Laslett (deputy headmaster) of the 12-year-old boys sent to his office. We were guilty. The cane swished down onto our outstretched left hands giving each of us "three of the best". Throwing darts during school recess periods was dangerous, but also such fun that we ignored demands to leave darts at home. When darts were confiscated we brought new ones. We stopped for a few days whenever caught, then resumed when teachers weren't watching! 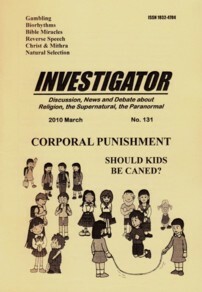 Debate on whether to spank unruly children swept the late 20th-century world and involved psychologists, politicians, religion, legislators, educators and the Bible. Magistrates, youth workers and people whose approach to problems of young delinquents has been wisely practical deplore from time to time the fact that there is possible under our rules no short, sharp punishment at the time of the offence, so that the child will realize the connection between his misdemeanour and public disapproval. In the long-term treatment, he can sometimes lose sight of the reason for all the fuss. Of all sanctions corporal punishment is the least effective in increasing moral restraint in the offender… If the teacher is mainly concerned with deterring others, however, there may be some point to such punishment. The evidence suggests that others can be vicariously conditioned by seeing an offender punished. In a decision that will come as a blow to millions of school children the Supreme Court ruled teachers in all States may spank misbehaving students, even if it is against the wishes of their parents. In a country where more than a million students are suspended from school each year on disciplinary grounds, the new ruling will be welcomed by most educationists. Although in several states and in New York City corporal punishment has been outlawed by school boards, the matter is now expected to be reconsidered. LONDON: Sixteen families whose children were caned at school have been awarded $102,000 by the Government in an out-of-court settlement. Ministers agreed to the award to prevent the likelihood of humiliation by the European Court of Human Rights, which has already ruled that children should not be beaten. Child-training expert Penelope Leach in Baby and Child opposed all smacking as ineffective: "Smacked children can never remember what they are smacked for. Pain and indignity mean that they go away seething with anger…"
Spanking doesn't make them resentful. They're just glad when it's over. The more protracted, psychological alternatives [e.g. withdrawal of privileges] are far worse. Physical discipline should only be used to combat aggression… But instances such as crossing roads or climbing trees they've been told not to can be corrected by physical means. We have found that hitting children can cause delinquency and criminal behaviour in future years… He added that many children seen at the child injury clinic were victims of: "parents who are reprimanding children but have lost control." If "beat" sounds damaging note that in English we have about 20 synonyms for "beat" ranging from mild contact to actions that cause physical damage whereas the Hebrew had correspondingly few words. The severity with which the rod is used is limited by other principles. The four verses in Proverbs must not be taken in isolation as if that's all what the Bible teaches. Secondly, the book of Proverbs mostly contains proverbs dealing with how to be prosperous, healthy, secure, respected and long-lived: "Hear, my child, and accept my words, that the years of your life may be many." (4:10; 3:1-2) "Folly" or "foolishness" therefore refers to conduct which puts at risk prosperity, health, security, respect, and life. Most corporal punishment, therefore, should aim to stop "foolishness" that could hurt the child or his future. Thirdly, parents should be examples of the conduct they expect of children — since the Bible condemns "hypocrisy". For some children parental example and teaching may suffice and no hitting is ever needed. Fourthly, a spanking need not follow after only one lapse since Christian forgiveness does not exclude children: "Be kind to one another, tenderhearted, forgiving one another." (Ephesians 4:32) A child's first failure to obey can be followed by forgiveness plus repetition of the instructions that he forgot or flouted. If physical discipline is necessary parents should administer it in a state of calmness. Instructions to maintain "self-control" (Galatians 5:23), subdue rage (Proverbs 15:18; 22:24), avoid "abusive speech and malice" (Ephesians 4:29-32), and promote peace (Proverbs 12:20) apply in all areas of life, and child discipline is no exception. By applying the "golden rule" some counselors advise parents to first test the punishment on themselves. Since biblical "discipline" is meant to enforce conduct that minimizes future harm, it itself should not cause harm. Christenson (1970) advises that punishment must as far as possible "spare the child's self-respect", not be given in the presence of brothers or sisters as that might awaken the "devilish pleasure of looking on". To confuse child-training that protects health and life and is enforced by smacks when repeatedly infringed, with gratuitous violence that inflicts physical injury, is to ignore the Bible. Noel Wilson (1991) opposes all spanking. The back-cover says: "…we violate our children, and then are puzzled when they respond by violating others, or themselves. Is there no way out? Only, he argues, if we relate to them as sensitive, feeling, thinking, fully functioning persons." Dr Stephen Juan (1990) cites Murray Strauss that corporal punishment leads to "physical injuries" and: "psychological injuries…aggression, lying, vandalism, delinquency, criminal behavior, retaliation, self-punishment tendencies, accident proneness, suicidal tendencies, inhibited and shy behavior, low self esteem, hatred of parents, rejection of teachers, poor relationships with classmates, unsatisfactory love affairs, excessive worry and anxiety, guilt, depression, running away from home, drug or alcohol abuse, and disappearance of a sense of self-responsibility". Strauss believes that "ending corporal punishment is one of the most important steps to achieving a less violent world." The sentiments by Wilson, quoted above, are nice. But I'm writing about situations where niceness fails. Children readily turn to harmful conduct if it amuses or peers approve. Reasoning with them may not stop them, just as it often fails to stop adults. In such cases we will "violate our children" and encourage them to "violate others" if we don't discipline. Sometimes children need to be "controlled and punished" for the same reason as adults do — when they do not control themselves. If reasoning, teaching and example always prevent harmful conduct then the world should be free of adult crime — since adult reasoning skills far surpass that of children. If, however, crime were never punished, if criminals were only reasoned with and released, civilization would, I suspect, disintegrate. The problem is, as argued previously, that evil conduct not forcibly stopped becomes habitual. How, then are psychologists who oppose corporal punishment getting it wrong? With many behaviors there are safe and unsafe ways of doing them. If we compare the casualties of employment with doing nothing, or compare motorized transport with walking, we might want to ban employment and cars. Governments, however, don't do that but instead legislate laws that enhance safety. Similarly with corporal punishment; we need parameters for safety and effectiveness — like the ones in the Bible. If a psychologist studies criminals in prison and asks them "Were you physically punished as a child" he'll get a high correlation since most parents sometimes physically punish children. But correlation is not causation. If we ask criminals "Did you live in a house or other dwelling" we'll get a 100% correlation between criminality and living in a house. Alice Farmer is wrong. Smacking is so effective that even in countries where it's illegal most parents smack occasionally. Discipline is better than permitting unruly behavior until the child hurts someone or waiting until repeated disobedience tempts adults to explode in anger. Pain is a fundamental aid to training. Many animals cuff, push or bite their young. Humans born without ability to feel pain, live short lives unless constantly supervised. They can break bones but not bother with doctors, despite having normal intelligence, because nothing hurts. Although Proverbs speaks of a "father" administering discipline, it's OK to sometimes delegate, such as to a school. Finally back to that confrontation with Mr Laslett. The stripes faded slowly and our left hands smarted for hours, but our dart-throwing at school stopped permanently. Effective! Christenson, L.1970 The Christian Family, Bacon Publishing. Juan, S. 1999 The Thrashing They Deserve, In: Only Human, Random House. Wilson, N. 1991 With The Best Of Intentions, South Australia. Wright, D. 1971 The Psychology of Moral Behaviour, Pelican, p. 240. In South Australia corporal punishment has been administratively stopped in all schools. But the Education Act has not been repealed to prevent corporal punishment which can therefore theoretically be reintroduced. The recently reelected State Government has stated that it will repeal corporal punishment in schools completely. In any case the required records of punishment have not been kept by most schools and any corporal punishment not recorded is an assault on the child by the teacher. The gradual collapse of the education system in SA with 1800 assaults by students on teachers in two years illustrates the need for a deterrent. Throughout my own school years in the 1960s and 1970s I never ever heard of any teacher being assaulted by a child. In the northern and southern suburbs teachers now walk in pairs and have 2-way radios in case more backup is needed.